To get better results one usually has to change something, and sometimes it strangely enough better results can be achieved from doing something which seems counter-intuitive: Slow Down. Anyone who has played a lot of sport knows that when things get disjointed and are not quite working seamlessly, the trick is to slow things down. Concentrate on getting your technique right and finding your rhythm again is usually the key to better execution and a better quality game. Trying to execute the same bad play or technique faster or harder just exacerbates the problem. So simply trying harder is not necessarily helpful at all. One adviser I had been working with is good, capable, technically strong and determined to do well. An excellent work ethic and attitude supported by good competency and skills. How can someone like that NOT do well? Yet for some reason the adviser had been struggling to get the results they wanted for some months. Their response was to simply work harder: which is admirable and says a lot about their character and tenacity. What happens though when you just start calling a lot more people, and do it with a greater sense of urgency and determination, and hustle harder to get business done and over the line is quite the opposite of what you were hoping to achieve typically – and that was especially true in this example. Business gets harder to do when you become frenzied and have that faint whiff of desperation in everything you do. I limited the adviser to making just 2 calls per day to prospects for 2 weeks. Every single call had to be very well prepared to make it count and make it work. Qualifying the prospect as well as possible; thinking through the script or words to be used on the phone; understanding the other persons issues as well as possible in advance; and putting a good strong benefit across early all mattered enormously when it was no longer just a “numbers game”. The amount of time spent on the phone – engaging in a conversation with the potential client – was no longer an issue. There were only 2 phone calls to be made today…as a result the adviser prepared better, and then engaged more meaningfully and conveyed a much stronger proposition – each call counted. Slow the activity down but improve the quality of it. Make what you do be as good as you can do it. Each prospect is valuable, so make a legitimate effort to give each one your best effort. Don’t just burn through good prospects because you feel there is a need to hustle harder. Don’t do lots of things badly, or worse, be caught doing lots of things that don’t count at all. Don’t waste valuable business opportunities simply because you want a result NOW. Invest time and attention in them, and they will give you the time and attention you want. 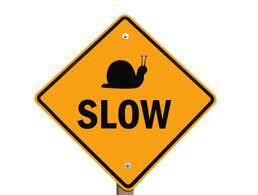 Slowing down is often the key to generating better results. Try it if you are struggling.